The United Mexican States (Spanish: Estados Unidos Mexicanos ), generally known as Mexico (Spanish: México ) is a country located in North America, bordered at the north by the United States, and at the south by Guatemala and Belize, in Central America. It is the northernmost and westernmost country in Latin America, and also the most populous Spanish-speaking country in the world. The site of advanced Mesoamerican or Amerindian civilizations, the land that currently makes up Mexico, existed as a Spanish colony for three centuries before achieving independence early in the nineteenth century. The first century of independence was tumultuous, culminating in the decade-long Mexican Revolution, followed by roughly seventy years of rule by the Institutional Revolutionary Party (PRI). As the only Latin American country member of the OECD since 1994, Mexico is firmly established as an upper middle-income country. 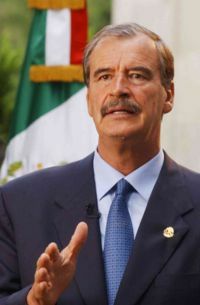 Elections held in July 2000 marked the first time since the 1910 Mexican Revolution that the opposition defeated the PRI and Vicente Fox of the National Action Party (PAN) was sworn in as President on 1 December 2000. Mexico is a powerful and influential neighbour of the United States, in terms of trade, culture, and diplomacy, with a history of emigration of Mexicans into the U.S. since the early 1900s. For almost three thousand years, Mexico was the site of several advanced Amerindian civilizations – the Mesoamerican cultures – such as the Olmec, the Maya and the Aztecs. The arrival of the Spanish conquistador Hernán Cortés defeated the Aztecs 1521, marking the beginning of the three hundred year-long colonial period of Mexico as New Spain. In 1519, the native civilizations of Mexico were invaded by Spain, this was one of the most important conquest campaigns in America. Two years later in 1521, the Aztec capital of Tenochtitlan was conquered by an alliance between Spanish and Tlaxcaltecs (the main enemies of Aztecs). Francisco Hernández de Córdoba explored the shores of South Mexico in 1517, followed by Juan de Grijalva in 1518. The most important of the early Conquistadores was Hernán Cortés, who entered the country in 1519 from a native coastal town which he renamed "Puerto de la Villa Rica de la Vera Cruz" (today's Veracruz). 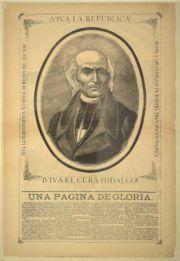 Miguel Hidalgo y Costilla, the father of the Mexican independence. On September 16, 1810, the independence from Spain was declared by Miguel Hidalgo in the small town of Dolores, causing a long war that eventually led to recognized independence in 1821 and the creation of the First Mexican Empire with Agustín de Iturbide being the first and only emperor. In 1824, the republic was proclaimed Guadalupe Victoria as its first President. During the first decades of its independence, Antonio López de Santa Anna was the strong man of Mexican politics, and on-and-off dictator. After Santa Anna revoked the federal constitution, Texas declared its independence, which they managed to obtain in 1836. The annexation of Texas by the United States created a border dispute, that would cause the Mexican-American War. This war resulted in a Mexican defeat. In the Treaty of Guadalupe Hidalgo of 1848 Mexico lost one third of its area to the United States. Dissatisfaction with Santa Anna's rule led to the liberal Revolution of Ayutla, beginning an era of liberal reforms, known as the Reforma. In the 1860s the country again suffered a military occupation, this time by France, seeking to establish the Hapsburg Archduke Ferdinand Maximillian of Austria as Emperor of Mexico, with support from the Catholic clergy and conservative Creoles. This Second Mexican Empire was fought off by then president of the Republic, the Zapotec Indian Benito Juárez, who managed to restore the republic in 1867. Porfirio Díaz, a republican general during the French intervention, assumed power in 1876. The period of his rule is known as the Porfiriato, which was noted by remarkable economic achievements but also by brutal oppression. The latter led to the Mexican Revolution in 1910, initially led by Francisco I. Madero. Madero was overthrown and murdered in 1913 by the reactionary general Victoriano Huerta. This caused a civil war, with such as Pancho Villa and Emiliano Zapata. The Revolution calmed down when the constitution of 1917 was proclaimed by Venustiano Carranza. Carranza was killed in 1920 and succeeded by Álvaro Obregón, who in turn was succeeded by Plutarco Elías Calles. In 1928 Obregón was reelected, but assassinated before he could assume power. This led Calles to found the National Revolutionary Party (PNR), which was later renamed to Institutional Revolutionary Party (PRI). During the next four decades, Mexico experienced impressive economic growth; some historians call this period "El Milagro Mexicano", the Mexican Miracle. This was in spite of falling foreign confidence in investment during the worldwide great depression. The assumption of mineral rights and subsequent nationalization of the oil industry into PEMEX during the presidency of Lázaro Cárdenas del Río was a popular move that sparked a diplomatic crisis with those countries whose citizens had lost businesses expropriated by the Cárdenas government. Although the economy flourished, the PRI rule became increasingly more oppressive, culminating in the Tlatelolco Massacre of 1968, where 250 protesters were killed by security forces. In the 1970s, discontent with the administration of Luis Echeverría brought the country on the brink of a civil war. The chronic weakness of Mexico's economy in the 1970s and 1980s included peso devaluation and price inflation, creating a strong need for tens of millions of poor Mexicans to migrate north to the United States. In 1982, the Mexican government announced that it could no longer pay its debts. The first cracks in the monopoly position of PRI began to appear in 1988, when the party had to resort to election fraud in order to prevent leftist opposition candidate Cuauhtémoc Cárdenas from winning the elections. Carlos Salinas was declared victor of the elections and embarked on a program of neoliberal reforms, culminating in the North American Free Trade Agreement (NAFTA) of 1994. However, the very same day Mexico joined the NAFTA, the Zapatista Army of National Liberation (EZLN) began an armed rebellion against the federal government. A series of political assassination and corruption scandals further damaged Salinas' reputation. In December 1994, a month after Salinas was succeeded by Ernesto Zedillo, the December Mistake led to a new economical crisis. Democratic reforms under Zedillo caused the PRI to lose its majority in Congress in 1997. In 2000, after 71 years, the PRI lost a presidential election to Vicente Fox of the National Action Party (PAN). In 2006, Felipe Calderón (PAN) was declared winner of that year's presidential elections with a razor-thin margin over Andrés Manuel López Obrador of the Party of the Democratic Revolution (PRD). López Obrador however claimed the election was stolen, and pledged to create an alternative government. Vicente Fox, the current president of Mexico. The 1917 Constitution provides for a federal republic with powers separated into independent executive, legislative, and judicial branches. Historically, the executive is the dominant branch, with power vested in the president, who promulgates and executes the laws of the Congress. Congress has played an increasingly important role since 1997, when opposition parties first formed a majority in the legislature. Government and politics of Mexico takes place in a framework of a federal presidential representative democratic republic, whereby the President of Mexico is both head of state and head of government, and of a pluriform multi-party system. Executive power is exercised by the government. The President is both the head of state and head of government, as well as the commander-in-chief of the military. The president is elected directly from eligible votes and serves for six years, called a sexenio. Legislative power is vested in both the government and the two chambers of the Congress of the Union. The powers of the congress include the right to pass laws, impose taxes, declare war, approve the national budget, approve or reject treaties and conventions made with foreign countries, and ratify diplomatic appointments. The Senate addresses all matters concerning foreign policy, approves international agreements, and confirms presidential appointments. The Chamber of Deputies, addresses all matters pertaining to the government's budget and public expenditures. PAN: the National Action Party (Partido Acción Nacional). The PAN is a liberal conservative party. President Vicente Fox is a member of the PAN. PRI: the Institutional Revolutionary Party (Partido Revolucionario Institucional). When it was founded it was somewhat socialist, currently it's a liberal party. PRD: the Party of the Democratic Revolution (Partido de la Revolución Democrática). The PRD is a left wing, somewhat socialist party. The Institutional Revolutionary Party (Spanish: Partido Revolucionario Institucional or PRI) is the Mexican political party that wielded hegemonic power in the country – under a succession of names – for more than seventy years. New hopes for democratic development were raised in 2000 by Vicente Fox and the centre-right party PAN's electoral victory over the long-governing PRI. In 2006, Felipe Calderón Hinojosa of the PAN faced Andrés Manuel López Obrador of the PRD in a very close election. As of August 2006, the results of this election remain disputed and a series of leftist protests remain underway despite the calls of President Vicente Fox for an end to the protests. On September 6th, 2006, Felipe Calderón Hinojosa was declared President Elect by the electoral tribunal. There are only 2 administrative and political subdivisions in Mexico: states (estados) and municipalities (municipios). The United Mexican States are an union of 31 states and a federal district. Each state has its own constitution and congress, and its citizens elect a governor (gobernador) as well as representatives (diputados locales) to their respective state congresses. Each Mexican state is divided into municipalities, the smallest official political entity in the country, and governed by a mayor (alcalde). The Federal District is a special political division in Mexico, where the national capital, Mexico City, is located. It enjoys more limited local rule than the nation's states: only since 1997 have its citizens been able to elect a Head of Government. It is divided into boroughs (delegaciones), each of them governed by a Borough Chief (jefe delegacional). 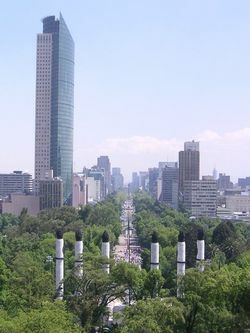 Looking along Reforma from Chapultepec Castle. 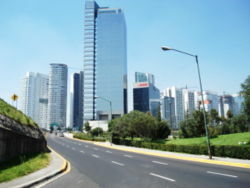 Santa Fe, one of Mexico City's five central business districts. According to the World Bank, Mexico ranks thirteenth in the world as regards GDP and has the fourth largest per-capita income in Latin America, following Argentina, Chile and Costa Rica. It is firmly established as an upper middle-income country. Since the economic crisis of 1994–1995, the country has made an impressive economic recovery. According to the director for Colombia and Mexico of the World Bank, the population below the poverty level has decreased from 24.2% to 17.6% in the general population and from 42% to 27.9% in rural areas from 2000- 2004 . Mexico has a mixed economy that recently entered the trillion dollar class. It contains a mixture of modern and outmoded industry and agriculture, increasingly dominated by the private sector. The number of state-owned enterprises in Mexico has fallen from over a thousand in 1982 to fewer than one hundred in 2005. Recent administrations have expanded competition in seaports, railroads, telecommunications, electricity generation, natural gas distribution, and airports. Mexico is also the fourth largest oil producer in the world. 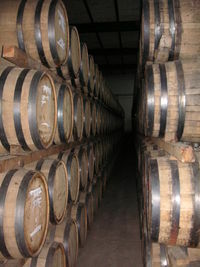 A strong export sector helped to cushion the economy's decline in 1995 and led the recovery in 1996–1999. Private consumption became the leading driver of growth, accompanied by increased employment and higher wages. Its proximity to the world's largest automobile market has meant that companies like Volkswagen and others have located assembly plants in Northern Mexico to serve that market. In addition there is a large television industry providing programming for both Mexicans and the large Spanish speaking population (44 million out of 285 million) in the United States. Mexico has entered a new era of macroeconomic stability. Following a 4.1% growth in 2004, real GDP grew 3% in 2005. According to the Bank of Mexico recent economic developments include a record-low inflation of 3.3% in 2005, low interest rates, a lower External debt to GDP ratio (8.9%) and a strong peso. Trade with the United States and Canada has tripled since NAFTA was implemented in 1994. Mexico has opened its markets to free trade like few other countries have done, lowering its trade barriers with more than forty countries in twelve Free Trade Agreements, including Japan and the European Union. The United States, however, remains Mexico's single largest trading partner, accounting for more than 85% of the country's trade. Government authorities anticipate that extending its free trade agreements to cover over 90% of its trade will lessen the country's dependence on the United States. The government is seeking to sign an additional agreement with Mercosur. Tourism in Mexico is a very large industry. The most notable tourist draws are the ancient Meso-American ruins, and popular beach resorts. The nation's temperate climate and unique culture – a fusion of the European (particularly Spanish) and the Meso-American – also make Mexico a large draw. The peak tourists seasons in Mexico are during December and during the mid-Summer, with brief surges during the week before Easter and surges during Spring break at many of the beach resort sites which are popular with vacationing college students from the United States. The vast majority of tourists to Mexico come from the United States and Canada and, to a lesser degree, from Europe and Asia. There is also a burgeoning domestic tourism trade as a growing affluent middle class begins to vacation within their own country as well as abroad. A small number of tourists also arrive from other Latin American nations. Mexico still needs to overcome many structural problems as it strives to modernize its economy and raise living standards. Ongoing economic concerns include low real wages, underemployment for a large segment of the population, inequitable income distribution (top 20% of income earners account for 55% of income), and few advancement opportunities for the largely Amerindian population in the impoverished southern states. If municipalities of Mexico were classified as countries in the HDI World Ranking, San Pedro Garza Garcia in the State of Nuevo Leon, and Benito Juárez, one of the districts in the Distrito Federal, would have a similar level of development to that of Italy, whereas Metlatonoc, Guerrero, would have an HDI similar to that of Malawi . The country has continued to struggle with such issues as economic control and development, especially with the petroleum sector and the evolution of trade relations with the United States. Corruption at certain levels of the administration and crime continue to be chronic problems. Racial and ethnical diversity in Mexican females. With an estimated 2005 population of about 106.5 million, Mexico is the most populous Spanish-speaking country in the world. Racially and ethnically, Mexico is a diverse country. Its three main ethnic groups are mestizos (mixed European and Amerindian people; 60% of the population); Amerindians (30%); and Europeans (9%; mostly German, French, Italian, Portuguese, Irish, Polish, Russian, British, and Swedish immigrants). Mestizo is a term that can be very ambigous to people outside Mexico because the features of a mestizo can dramatically vary between those who look almost European and those who look more Amerindian. European Mexicans are mostly Spanish; the remaining minorities are largely comprised of Afro-Mexican, Middle Eastern and East Asian people. A large Chinese community exists in Mexicali, Baja California and there has been a small but steady influx of Filipinos since the late sixteenth century. According to the Comisión Nacional para el Desarrollo de los Pueblos Indígenas (the National Council for the Development of Indigenous Peoples), the culturally and linguistically affiliated Amerindian population in Mexico numbers approximately 12.7 million. The Mexican government, however, does not collect racial information during censuses. In 2004, the National Institute of Statistics, Geography and Data Processing estimated there were 12,089,094 indigenous people (approximately 11.4% of Mexico's population), of whom over one million did not speak Spanish and almost five million were bilingual INEGI, 2004. Judging by the proportion of people speaking indigenous languages, the states with the highest proportion of indigenous people are Yucatán (37.3%), Oaxaca (37.1%), Chiapas (24.6%) and Quintana Roo (23%). The states of Aguascalientes (0.2%), Coahuila (0.2%), Zacatecas (0.2%) and Nuevo León (0.5%) have the lowest proportion of speakers of indigenous languages (INEGI, 2004). The large-scale German settlement period of the mid 19th century in Northeast Mexico has blended in with the local culture, thus usage of the German language has declined there. The German and Northern Mexican cultural bond with Texas remains alive. Mexico is also home to the greatest number of U.S. citizens living outside U.S. territory. This may be due to the growing economic and business interdependence of the two countries under NAFTA and Mexico's increasing popularity among retirees. A clear example of the latter is seen in San Miguel de Allende and many towns along the Baja California peninsula and around Guadalajara, Jalisco. The official figure for foreign-born citizens in Mexico is 493,000 (since 2004), with a majority (86.9%) of these born in the United States (except Chiapas, where the majority of immigrants are from Central America). The five states with the most immigrants are Baja California (12.1% of total immigrants), Mexico City (the Federal District; 11.4%), Jalisco (9.9%), Chihuahua (9%) and Tamaulipas (7.3%). More than 54.6% of the immigrant population are fifteen years old or younger, while 9% are fifty or older. The large number of children may be because of the Central American population, or the American population consisting largely of Hispanics, or Americans taking advantage of lower costs of living to raise larger families. 4.2% of male immigrants and 3.8% of female immigrants did not have formal education while 20.2% of male immigrants and 17.7% of female immigrants had a college degree (INEGI, 2004). Ironically, because of its reputation as a major source of undocumeted immigrants to the United States in el Norte, Mexico itself experiences this kind of immigration from Central America because of similar differences in wages and poverty between countries of origin and Mexico; analogous to the economic differential between the U.S. and Mexico. Many undocumented Central American immigrants in Mexico ultimately try to enter the United States, though some decide to stay. Life expectancy in Mexico increased from 34.7 for men and 33.0 years for women in 1930 to 72.1 for men and 77.1 years for women in 2002. The states with the highest life expectancy are Baja California (75.9 years) and Nuevo Leon (75.6 years). The Federal District has a life expectancy of the same level as Baja California. The lowest levels are found in Chiapas (72.9), Oaxaca (73.2) and Guerrero (73.2 years), although the first two have had the highest increase (19.9 and 22.3% respectively). The mortality rate in 1970 was 9.7 per 1000 people; by 2001, the rate had dropped to 4.9 men per 1000 men and 3.8 women per 1000 women. The most common reasons for death in 2001 were heart problems (14.6% for men 17.6% for women) and cancer (11% for men and 15.8% for women). Mexicans tend to be people-oriented, putting friends, family and relatives before work or business matters. Starting in the 70's, the government supported the use of birth control, despite the country being predominantly Roman Catholic. Mexico boasts a wealth of regional cultures that is unique in America. Every region in the country has a distinct culture, languages, and arts that create a huge mosaic as a whole. Traditionally, Mexicans have struggled with the creation of a united identity. The issue is the main topic of Labyrinth of Solitude by Mexican Nobel Prize winner Octavio Paz. Mexico is a large country, therefore having many regional cultural traits. The north of Mexico, because of its historically high proportion of non-Spanish immigrants, is the least traditionally Mexican and most cosmopolitan of them all, making it a less exciting destination for foreign travelers. Central and southern Mexico is where many well-known traditions find their origin, therefore the people from this area are in a way the most traditional, but their collective personality can't be generalized. People from Puebla, for instance, are thought to be conservative and reserved, and just a few kilometers away, the people from Veracruz have the fame of being very outgoing and liberal. The México City middle classes are believed to be arriviste and prone to debt, or crime-prone if talking about the poor. The regiomontanos (from Monterrey) are thought to be cocky regardless of their social status, due to Northern prosperity. Different accents are used in almost every state in Mexico, making it fairly easy to distinguish the origin of someone by their distinct use of language. Pure pre-Hispanic Americans (known as "Native Americans" or "Indians") are likely to be perceived as inferior, even though this rarely reaches the level of aggressive racism. It's a rarity to see pre-Hispanic Americans in high positions. This hidden racism is latent in the use of the word "indio" as an insult for the darker skinned, which is even used between indigenous people to offend each other. Racism against those of African ancestry is said less prevalent than in the U.S., but some Mexicans of African descent have protested against negative racial stereotypes. Mexicans living in the United States, legally or illegally, are looked down upon by most middle class and high class Mexicans, since they feel they are creating a bad reputation for the rest of the Mexicans. Many terms that refer to Mexicans in the U.S.A. exist, but Chicano, (a person born in the U.S.A. of Mexican descent) or Pocho ( a person born in the U.S.A. with one parent Mexican and the other Anglo-American, and those who speak broken Spanish, or "Spanglish") are the most popular. In central and southern Mexico, these terms are used as a derogatory description. The majority of Mexican men or families that pursue a life in the U.S. come from the lowest economic stratus of society in Mexico, and have created a culture unique to them. The standard of living in Mexico is higher than most of other countries in Latin America drawing people from places like Argentina, Brazil or Cuba to the country in search for better opportunities. With the recent economic growth, most middle and high-income families live in single houses, commonly found within a walled village, called a fraccionamiento. The reason these places are the most popular among the middle and upper classes is that they offer a sense of security, since most of them are within walls and have surveillance, and living in one also provides social status, due to the infrastructure of most of these villages. Swimming pools or golf clubs, and/or some other commodities are found in these fraccionamientos. Houses inside them tend to be of higher quality, and larger than other homes, most of them with at least three or four bedrooms and even maid quarters and laundry. However, the poorer Mexicans live a harsh life. Poverty is specially poignant in the countryside. In the larger towns, hiring housekeepers or maids is not as common as in the past, but there are still many families that are willing to pay a person, generally a middle aged woman, to come help with the house chores once or twice a week. The gender roles for women in Mexico are generally strict, although this has lessened in the country's upper-classes influenced by Anglo cultural trends and some Mexican women are challenging patriarchal societal mores where males continue to practice " machismo", a major Latin American cultural norm (yet is stereotyped) of men are strong, self-reliant and aggressive. Dancing and singing are commonly part of family gatherings, bringing the old and young together, no matter what kind of music is being played, like mariachi, rancheras, cumbia, salsa, merengue or the more Mexican banda. Dancing is a strong part of the culture, and visitors will find that even people who were thought to be unlikely to dance, do so. Singing enjoys the same popularity and Mexicans will sing mostly in family and friend reunions. Also, a place, such as a restaurant, with live music and singing will be a preferred choice for Mexicans to eat. Mexicans in places like Guadalajara, Puebla, Monterrey, Mexico City, and most middle sized cities, enjoy a great variety of options for leisure. World-class shopping centers are a favorite among families, since there has been an increasing number of new malls that cater to people of all ages and interests. A large number of them, have multiplex cinemas, international and local restaurants, food courts, cafes, bars, bookstores and most of the international renowned clothing brands are found too. Mexicans are prone to travel within their own country, making short weekend trips to a neighbouring city or town. The favorite sport remains football (soccer), while baseball is also popular, especially in the Gulf of Mexico and the border states in the NW. The season runs from March to July with playoffs held in August. The Mexican professional league is named the Liga Mexicana de Beisbol. American football is practiced at the major universities like UNAM, UDLA (University of the Americas), UANL ( Universidad Autónoma de Nuevo León) and ITESM ( Instituto Tecnológico y de Estudios Superiores de Monterrey), and there's a strong following of the NFL in Mexico with the Steelers, Cowboys, Dolphins and Raiders being the most polular teams. Rugby is played at the amateur level throughout the country with the majority of clubs in Mexico City and others in Monterrey, Guadalajara, Celaya, Guanajuato and Oaxaca. The national sport of Mexico is Charreria. Ancient Mexicans played a ball game which still exists in Northwest Mexico (Sinaloa, the game is called Ulama), though it is not a popular sport any more. Bullfighting is also a popular sport in the country. Almost all large cities have bullrings. La Monumental in Mexico city, has the largest bullring in the world, which seats 55,000 people. A stucco relief in the Palenque museum, Palenque, Chiapas, Mexico. Compared with other North American nations, the Mexican Constitution does not mention the existence of an " official language". Spanish, however, is mentioned in the treaty of Las Tres Garantias, where Agustin de Iturbide declares the unity of all Mexicans through Spanish as the official language of Mexico. Although Spanish is considered to be the "common" language of the country, used officially and spoken by the majority of the population, about 7% of the population speak an American dialect and the government officially recognizes sixty-two American languages. Of these, Nahuatl and Maya are each spoken by 1.5 million; while others, such as Lacandon, are spoken by fewer than one hundred people. The Mexican government has promoted and established bilingual education programs in indigenous rural communities. A few tribes, such as the Kickapoo and the Cherokee, came to the state of Coahuila in the nineteenth century to escape U.S. army raids and are said to maintain their language and culture to a certain extent. English is widely used in business. As a result, English language skills are much in demand and can lead to an increase in the salary offered by a company. It is also spoken along the border with the USA and in big cities and beach resorts. The majority of private schools in Mexico offer bilingual education, both in Spanish and English. English is the main language spoken in U.S.A. expatriate communities such as those along the coast of Baja California, Jalisco and the town of San Miguel de Allende. With respect to other European languages brought by immigrants, the case of Chipilo, in the state of Puebla, is unique, and has been documented by several linguists such as Carolyn McKay. The immigrants that founded the city of Chipilo in 1882 came from the Veneto region in northern Italy, and thus spoke a northern variant of the Venetian dialect. While other European immigrants assimilated into the Mexican culture, the people of Chipilo retained their language. Nowadays, most of the people who live in the city of Chipilo (and many of those who have migrated to other cities) still speak the unaltered Veneto dialect spoken by their great-grandparents making the Veneto dialect an unrecognized minority language in the city of Puebla. In Huatusco and Colonia Gonzalez, Veracruz, Veneto is still heard too. A similar case is that of the Plautdietsch language, spoken by the descendants of German and Dutch Mennonite immigrants in the states of Chihuahua and Durango. Other German communities lie in Puebla, Mexico City, Sinaloa and Chiapas, with the largest German school outside of Germany being in Mexico City (Alexander von Humboldt school), these represent the large German populations where they still try to preserve the German culture and language. Other strong German communities lie in Sinaloa ( Mazatlan), Nuevo Leon, Chiapas ( Tapachula) and other parts of Puebla ( Nueva Necaxa) where the German culture and language have been preserved to different extents. French is also heard in the state of Veracruz in the cities of Jicaltepec, San Rafael, Mentideros, and Los Altos, where the architecture and food is also very French. These French immigrants came from Haute-Saône département in France, especially from Champlitte and Borgonge. Another important French group were the " Barcelonettes" from the Alpes-de-Haute-Provence département, who migrated specifically to Mexico to find jobs and work in merchandising and are well known in Mexico City, Puebla, and Veracruz. Another important French village in Mexico is Santa Rosalía in Baja California Sur, where French language and culture/architecture are still found. Scandinavian languages and traditions can also be heard in Chihuahua, such as Swedish and Norwegian in Nueva Escandinavia and other Scandinavian colonies in the north of the country. Russian is heard in the Baja California region of Valle de Guadalupe, thanks to the immigrants from southern Russia who settled these areas. They are the Molokans ("milk eaters"), and they preserve their culture in Baja California, with the architecture in their houses and museums, they produce fine wine (Along with the large Italian community that lives near them) and their language and traditions, as well as dresses and festivities. Other Russians belong to a more recent wave of immigration from mainly Russia and Poland and the Ukraine along other Eastern Europeans, who settle mainly in Mexico City and Guadalajara. The wave of Armenians, Lebanese, Syrians and Greeks came to Mexico in the early twentieth century, mainly settled in urban areas and Baja California and Sinaloa, especially Greeks in the city of Culiacan, in proximity to relatives in California, U.S. is one notable migration. 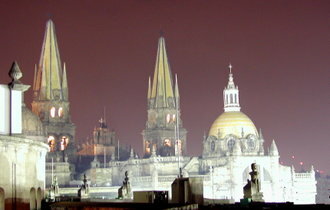 The Lebanese have settled in the urban areas such as Mexico City, Guadalajara, Monterrey, and Puebla. Cornish dialect of Cornwall, England disappeared from Mexico in the state of Hidalgo in the early 20th century, especially in the cities of Pachuca and Real del Monte, but the Cornish culture still survives in the architecture, sports, food and many aspects of these cities in central Mexico. Mexico is predominantly Roman Catholic (about 89% of the population). It is the nation with the second largest Catholic population, behind Brazil. Also, 6% of the population adheres to various Protestant/ Restoration faiths (e.g. Latter-day Saints, Pentecostal), etc. Mexico is the nation with the second largest LDS population, 1,043,718, (a little less than 1%),just behind the USA (5,690,672). The remaining 5% of the population adhere to other religions or profess no religion. Some of the country's Catholics (notably those of indigenous background) syncretize Catholicism with various elements of Aztec or Mayan religions. The Virgin of Guadalupe has long been a symbol enshrining the major aspirations of Mexican society. According to anthropologist Eric R. Wolf, the Guadalupe symbol links family, politics, and religion; the colonial past and the independent present; and the indigenous and the Mexican. Judaism has been practiced in Mexico for centuries. Many are descended of Jewish people who were converted forcibly to Catholicism in 1492 or earlier, and were forced to practice their religion in secret until the Inquisition was abolished in Mexico and they were free again to practice their ancestral faith openly. There are estimated to be more than 45,000-50,000 (some estimates say 60,000) Jews in Mexico today. Islam has 318,608 adherents, according to official data, and is mostly practiced by Mexicans of Arab (mainly Syrian) and Turkish descent, though there is a very small percentage of the indigenous population in Chiapas state who adhere to Islam. Mexico has a very tiny Sikh population in the country of east Indian origin. The small number of Asian ethnic groups in Baja California have introduced Hinduism and Buddhism, but their members are generally small segments of Mexico's religious profile. Mexico has made impressive improvements in education in the last two decades. In 2004, the literacy rate was at 92.2%, and the youth literacy rate (ages 15-24) was 96%. Primary and secondary education (9 years) is free and mandatory. Even though different bilingual education programs have existed since the 1960s for the indigenous communities, after a constitutional reform in the late 1990s, these programs have had a new thrust, and free text books are produced in more than a dozen indigenous languages. In the 1970s, Mexico became the first country to establish a system of "distance-learning". Schools that use this system are known as telesecundarias in Mexico. The Mexican distance learning secondary education is also transmitted to some Central American countries and to Colombia, and it is used in some southern regions of the United States as a method of bilingual education. The largest and most prestigious university in Mexico, today numbering over 269,000 students, is the National Autonomous University of Mexico ( Universidad Nacional Autónoma de México) founded in 1551. Three Nobel laureates and most of Mexico's modern-day presidents are among its former students. UNAM conducts 50% of Mexico's scientific research and has presence all across the country with satellite campuses and research centres. 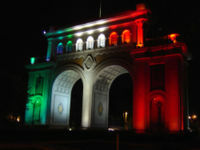 The National Autonomous University of Mexico occupies the 74th place in the Top 200 World University Ranking published by The Times Higher Education Supplement in 2006 , making it the highest ranked Spanish-speaking university in the world as well as the first Latin American university. The second largest university is the National Polytechnic Institute (IPN). These institutions are public, and there are at least a couple of public universities per state. There are also private universities like the Monterrey's Technological and Higher Education Institute (ITESM), which is ranked by the Wall Street Journal as the 7th top International Business School worldwide (it has thirty-two secondary campuses, apart from the Monterrey Campus), Mexico's Autonomous Technological Institute (ITAM), Universidad de las Américas Puebla (UDLAP), the Ibero-American University ( Universidad Iberoamericana). There are high crime rates in localized parts of the country. Mexican drug cartels deliver more than half of the methamphetamine supply into the United States. The persistence of corruption at certain levels of the government and the police has prevented effective crime control efforts. Police corruption remain as a problem in Mexico, and are mostly fuelled by the lucrative drug trade and migrant smuggling. Between January and June 2006, drug wars between cartels claimed 1,003 victims. The problem is especially dangerous in the border city of Tijuana and in the coastal city of Acapulco, which is a key link to the United States and México City. 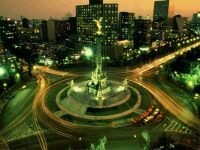 Mexico City continues to experience crime problems, particularly with street crime and kidnappings, and also a new type of kidnapping called "Express kidnapping" usually in which the victim is carjacked and beaten. It is estimated that there are between 2000 and 3000 crimes committed on the streets of Mexico City every day. Approximately 600 are reported (2000 average). Most of these are muggings, although the breakdown of the figures runs the gamut of criminal activity. Murders are not a significant part of the problem. These average around 2.5 per day which, given the size of the population, is relatively few. To put it in context, Washington, D.C. has a murder rate per capita around 5 times higher. Mexico is named after its capital city, whose name comes from the Aztec city Mexico-Tenochtitlan that preceded it. The Mexi part of the name may have been derived from Mexitli, a tribal war god whose name may have been derived from the words metztli (the moon) and xictli (navel) and may mean "navel (possibly implying 'child') of the moon", or from Mectli, a goddess known to the early wandering pre-Aztecs peoples and whose name can be translated as "navel of the maguey" or "maguey grandmother" (in several sources, it was she who first sent the ancestors of the Mexica on their trek southwards into empire and history). Mexico is the home of the people of Mexitli or Mectli (the Mexicas), co meaning "place" and ca meaning "people". Mexico can also be translated as "the place of Mectli's people near the nopal cactus." The symbol in myth of Tenochtitlan's founding, an eagle perched on a nopal cactus which arose from the lake on which the city was built, is still found on Mexico's national flag today. When the Spaniards conquered Mexico and imposed their own language (Spanish), they naturally did so according to the spelling rules of the Castilian language of the time. The Nahuatl language had a /ʃ/ sound (like English "shop"), and this sound was written x in Spanish (e.g. Ximénez); consequently, the letter x was used to write down words like Mexitli. Meanwhile, the letter j (or, rather, the letter i when used as a consonant, since j was not yet in common usage) was used for the /ʒ/ sound (as in "vision"), as was g before e or i. These old pronunciations of j and x are still found in Portuguese, Catalan and Ladino. Over the centuries, the pronunciation of Spanish changed. Words like Ximénez, exercicio, xabón and perplexo started to be pronounced with a /x/ (this phonetic symbol represents the sound in the word "loch"). The /ʒ/ sound also started to be pronounced this way. The coalescence of the two phonemes into a single new one encouraged scholars to use the same letter for the sound, regardless of its origin (Spanish scholars have always tried to keep the orthography of their language faithful to the spoken tongue). It was j/g that was chosen. So, modern Spanish has ejercicio, ejército, jabón, perplejo, etc. (Another example is the old spelling of Don Quixote which is now Don Quijote. The old pronunciation is maintained in Portuguese "Quixote" and in French "Quichotte", and the English word " quixotic" maintains the spelling while pronouncing it with its English value.) In modern Spanish, x is used to represent the /ks/ consonant cluster in words derived from Latin or Greek. Proper nouns and their derivatives are optionally allowed to break this rule. Thus, although xabón is now incorrect and archaic, alongside many millions of people called "Jiménez", there also are plenty called "Giménez" or "Ximénez" — a matter of personal choice and tradition. In Mexico, it has become almost a matter of national pride to maintain the x spelling in the name of the country. It is regarded as more authentic and less jarring to the reader's eye. Mexicans have tended to demand that other Spanish-speakers use this spelling, rather than following Spaniard rules, and the demand has largely been respected. The Real Academia Española states that both spellings are correct, and most dictionaries and guides recommend México first, and present Méjico as a variant. Today, even outside of the country, México is preferred over Méjico by ratios ranging from 15-to-1 (in Spain) to about 280-to-1 (in Costa Rica). X is also used in the local placenames " Oaxaca" and " Xalapa" or former territories like " Texas"; in places like " Xochimilco", however, the x represents a /ʃ/. A cultural side-effect of the fact that Mexicans use México /'mexiko/ and Spaniards sometimes use Méjico to represent the same pronunciation is that the mere act of using the j spelling is interpreted by some as a form of colonial aggression, even though a wide majority of Spaniards is not aware of the controversy at all. On the other hand, some Peninsular scholars (such as Ramón Menéndez Pidal) preferred to apply the general spelling rule, arguing that the spelling with an x could encourage non-native students of Spanish to mispronounce México as /'meksiko/. In the Nahuatl language, from which the name originally derived, the name for Mexico is Mexihco ( International Phonetic Alphabet /meː.ɕiʔ.ko/).